Check out the story of the unlikely descendant of a Hero who finds himself beset by beautiful brides from another world as he tries to figure out just how he is going to handle the situation he finds himself in with the three other-worldly women and lead a happy married life. Angel, Devil, Elf and Me! 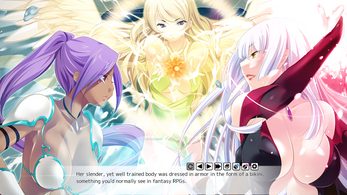 is the English localization of a Visual Novel originally created by prolific Japanese developer Norn/Miel. We at Cherry Kiss aim to provide an authentic Japanese Visual Novel experience to gamers outside of Japan. I'd love to purchase this game. Unfortunately I refuse to support censorship. Looks like a great game, I'm sad that its censored.